Hey friends!! When was the last time you took a close look at your blinds? Go ahead and go look, I’ll wait. We hardly ever think about our blinds until we decide to do a good spring cleaning – OR – you’re peeking out the window and realize that you just left a huge fingerprint in an inch of dust on one of the slats. YUCK! Having pets and kids in the house can really do a number on our windows, especially the blinds. 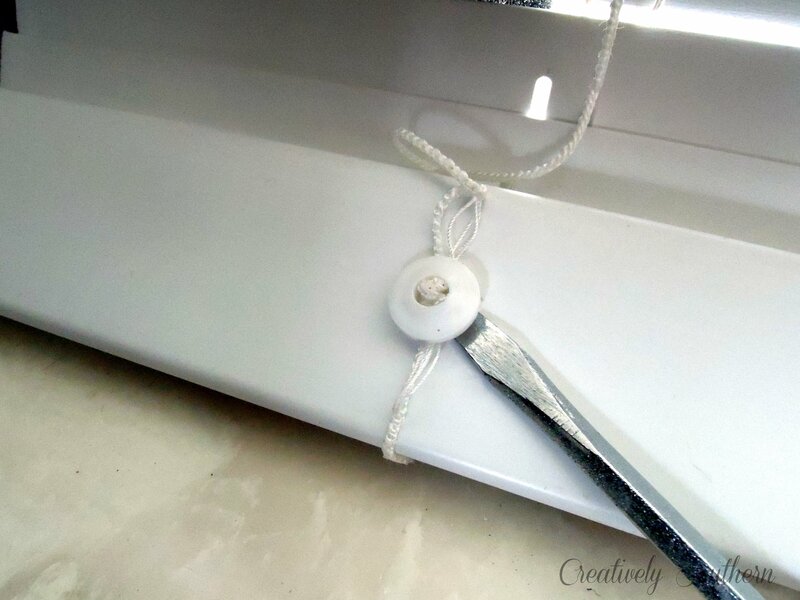 If you ever wanted to know how to clean blinds the easy way, here’s my tips! The Way We’ve Always Done It.. Step 3: Resort to the swiffer wipes. Cleaning and scrubbing every. single. slat. on our blinds. That’s enough to make you want to rip them all down and start over. Who has time or patience for that? Maybe you, and I admire you if you do! This time I’ve found an easy way to clean our blinds. Now, this first method I’m going to share is for plastic or faux wood blinds. I’ll talk about the best way to clean your real wood blinds a little further down. If you are into homemade non-chemical cleaning methods, then I admire you and want to be like you. Seriously, I want to learn your methods. Nonetheless, this post might not be for you, sorry! However, I believe you can still achieve CLEAN by using Castile Soap and maybe a bit more agitation of the water instead of the method I’m about to share with you. I like fast and easy – and disinfected – so I used this method below. We have a huge bathtub in our master bath and it worked perfectly for cleaning the blinds, but any size tub that fits your blinds will work. I mixed some bleach with hot water in the tub, and let the blinds soak for a about 5 minutes. Drain and rinse extremely well. If you wanted to try a safer route, I recommend using vinegar instead of the bleach. That will be my next method. Also if you’re blinds are not white (or supposed to be white in my case) then I wouldn’t recommend bleach as it may discolor them. You could also substitute the bleach for Dawn dish soap. It happened to a warm day out when I did this, so I laid our blinds out in the sun as we dried them. I used a towel to get the excess water off the blinds and the mechanical components and let the good sunshine do the rest! What if I have REAL wood blinds?? Okay now I know some of you are going to gasp and say, “NO, water will completely ruin my wood blinds.” I get it, and yes, it could. The company that sold those wood blinds to you would most likely fall out of their chair with what I’m about to tell you. 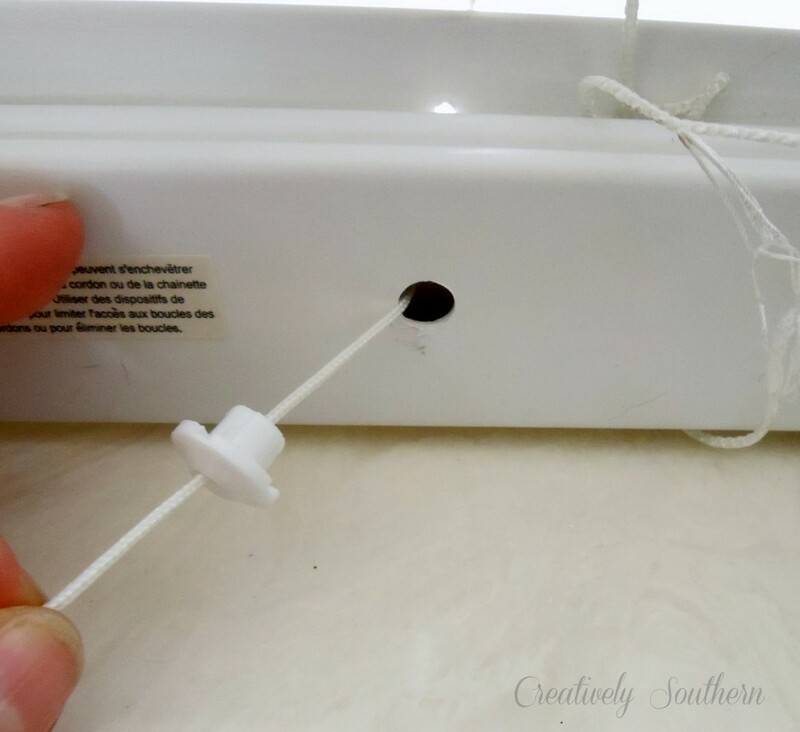 So if you are desperate to get your blinds clean… if you have an inch of grime that has built up over more than a year, if you are at your wits end of just tossing them out or living with the grime, then hear me out on this. To get your wood blinds clean, you can use the same method above BUT with some changes. Instead of bleach or Dawn dish soap, use Murphy’s Oil Wood Soap in your hot water. It doesn’t take much, maybe a cap full. Gently lower your blinds into the water. We just want to dip the blinds in the water maybe 2-3 times gently. Be sure to just dip the blinds, and not let them soak. We do not want to completely saturate the wood. Remove the blinds from the water and wipe with a towel immediately to prevent spotting, discoloration, or warping. If you are worried about the water with the wood, then I would recommend using a very dry/damp sponge and cleaning them by hand. I also like my new Linkyo Spin Mop for wood floors and it could be used to clean your wood blinds. Just lay them flat and use the microfiber mop head to clean your blinds! I use this cleaner with it. LOVE IT and totally worth every penny!! And then there’s those Venetian Fabric Blinds! Fabric blinds can be tricky to clean. For regular dust and dirt, use a vacuum cleaner. But for heavier dust, wipe each slat gently with a dry sponge. Maybe there are stains on the fabric. You can try sponging on warm water or mild liquid soap. Blot, don’t rub, because rubbing can damage the fabric. I recommend testing any cleaning product in an inconspicuous area first! Somehow in the transporting of the blinds from the upstairs bathroom to the back deck, I broke one of the slats. Although I thought this was a great excuse for some new window treatments, I decided I better go with a DIY quick fix. All I had to do was replace the broken slat with a perfectly good one! Luckily I had a couple of extra slats on the bottom of the blinds. I used the same technique to fix my blinds that is used when you need to shorten them. Then pull out all the extra string and remove the plastic button. I had to cut the pull cord to remove the plastic button. Cut just above the knot. 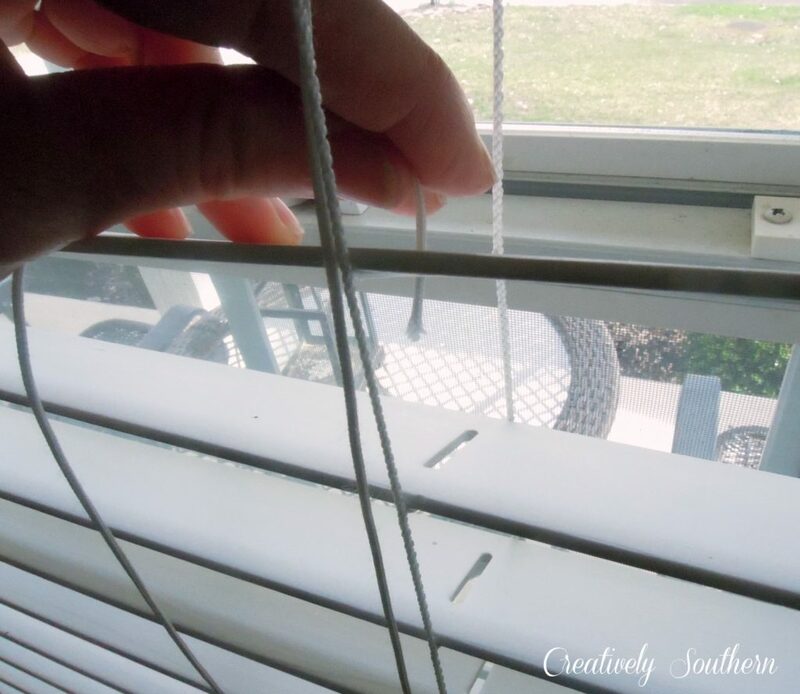 Then locate your broken slat in the blinds and slide the pull cord all the way out to that location. 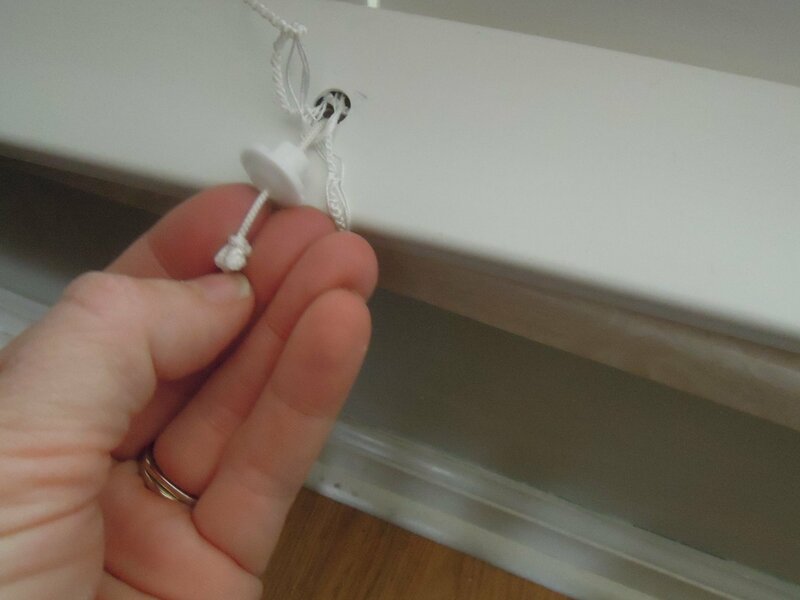 Once the pull cord is pulled out (no pun intended) on both sides, you can easily slide the broken slat outta there and move a new one from the very bottom into it’s place. Presto!! Then just re-thread the pull cord back through all the slats until you reach the bottom. Re-thread the plastic buttons back onto the pull cords and tie a knot to hold it on. Push all the extra strings back into the hole and secure the plastic button and you’re done!! Now I’ll be keeping the faux wood blinds a little longer. With the quick cleaning I did on them, they look brand new!! No more sticky fingerprints or who knows what else. Hope you have a great week! Anyone else out there getting Spring Fever yet?? This is some really good information about cleaning your blinds. I liked that you pointed out you should know if your blinds are made out of real wood. It does seem like that would change how you clean the blinds. 🙂 Thanks Penelope! Yes, it would definitely change the way you clean them if they are real wood. I wouldn’t want to soak them in the tub. I’d recommend some Murphy’s Oil Wood Soap and wipe those beauties down with a damp cloth if they are real wood. Thanks so much for commenting!! This is the best and absolutely the only way to clean blinds. Every other technique with the one-at-a-time slat cleaning is ludicrous. My mother’s generation, 1950+, all cleaned their blinds this way. It is so easy and effective, it’s not a big deal to clean and keep them clean. So glad to see this post. Thank you!! It’s almost time for me to start cleaning all of the blinds again for Spring so time to fill the tub! 🙂 I appreciate your kind words! This is great. Just don’t try it on metal blinds. Mine peeled the protective coating like a bad sunburn. These are the faux wood blinds Ana, so YES! You can soak them in water for a short amount of time. I only left mine in the water for maybe 10 minutes the last time and it worked great! If you don’t want to use bleach, I use super hot water in the bathtub with a 1/2ish cap of laundry detergent – works amazing! I just let them soak for a while, then rinse them off with the showerhead, and hang them over our fence out back to dry in the sun – it’s amazing because it even gets the cords clean which of course you can’t do when doing them all by hand. That’s a great idea and a safer solution if you do not want to use bleach. Thank you Laura for sharing this! I would bet some Borax added to the mix of laundry detergent would work great as well! The best way to clean plastic or metal blinds is to hang them in the garden between two suitable props and hose them down. Allow to dry in the sunshine but choose a calm day. Works well when I can finally be bothered to do it. 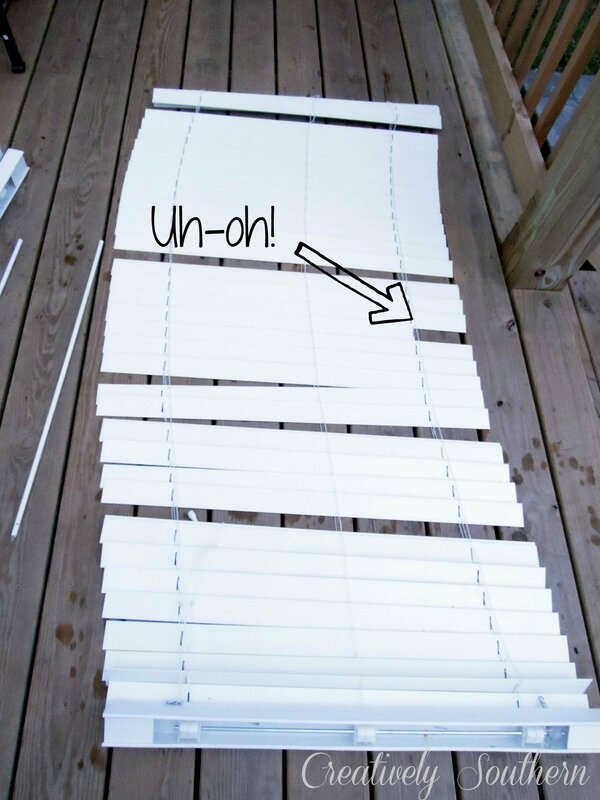 Thank you for the tip on how to fix the broken slat in the blinds! My cat broke a slat in one of our bedroom blinds five years ago and I have just left it all these years. Was looking for tips on cleaning blinds and found your tip. All fixed now!! Don’t ya just love all those little things that need to fixed that we never seem to get around to? Yes, I have a lot of those on my to-do list! 🙂 Glad this was helpful to you!! Thanks for visiting and commenting! Love your paint job. Do you know the name of the color? Hi Marianne! Yes, it is Great White Way from Lowe’s. Actually I may have given you the wrong color! Yikes! 😉 You want the color of the office wall?? That is Sherwin Williams Aloof Gray. I love it!!! I just did my kitchen blinds today, I use to be a smoker, so between that, grease, and one was one my kitcken window right in front of my sink and the blind comes down to the counter so there was a real dried on mess! I got out my quick n brite it comes as a paste but you melt it down in the microwave and then add water. I used about 2 tablespoons quick n brite to about 2 cups of water. I used a brush and brushed it on but you can putinto a spray bottle. Let set for a few minutes then wipe down. Quick n brite is non toxic safe around children and pets. Mixture is also great to spray on your cabnets as well, cuts the grease but doesnt hurt the finish. I am allergic to everything and i can use this with no problems. Thanks Dianne! Great tips on the Quick n Brite! And good to know it’s safe for children and sensitive skin. I’m definitely going to be checking it out. Spring Cleaning time is here! So can I do this with my wood slatted blinds?? Hi Laura! Thanks so much for your question. 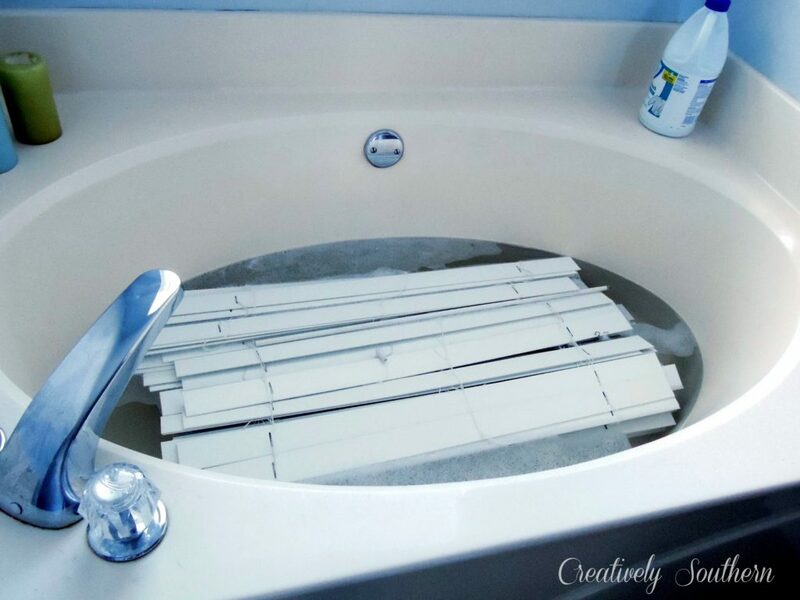 I would not recommend dropping your real wooden slat blinds into the tub of water. Mine are faux wood and it worked out great. But I would be afraid of messing up the actual wooden blinds. You could try using some Murphy’s Oil wood soap and wipe them down with a fabric softener sheet to help repel dirt and dust in the future. 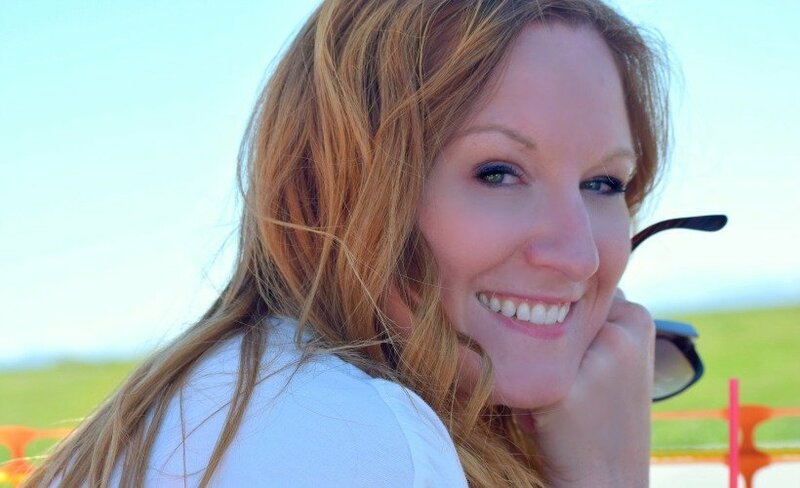 I would recommend you check out the post over at hometalk. If you read thru the comments, there is even more tips and advice from readers there. 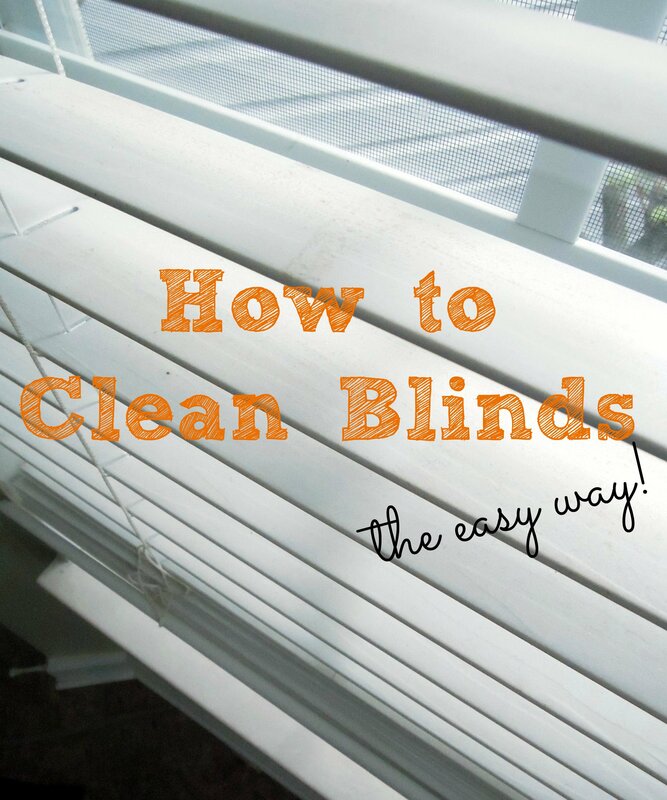 Here is the link: http://www.hometalk.com/1067002/how-to-clean-blinds-the-easy-way Hope this helps!! I broke a slat just like that on similar blinds, and I just glued the broken piece back on with a quick grab super glue. Worked surprisingly well. Just use a tiny amount of glue so you don’t glue the slat to the cord by mistake! Kerri, I almost did the same thing! In fact, if I didn’t have a few extra slats on the bottom of the blinds, I would have definitely had to glue some pieces back together. Great tip!! Thanks for your comment and for visiting! In lieu of bleach mix in Hydrogen Peroxide; it actually kills viruses as well as germs which bleach does not. My pediatrician’s office uses it in lieu of bleach because bleach is so toxic to your indoor air. That’s a great idea sfarq. Thanks for sharing! How much peroxide and is this in the tub? Plastic blinds help please!!!!! great tips, thank you. blinds are a love hate relationship… for a safe product try simple green. I use it on EVERYTHING… car floors bathroom even my rubber stamps. and its amazing and safe for pets and if course our little munchkins! Thanks Tameria! Simple Green is an awesome product! Great idea! This is genius. So… does this washing technique also work for those “wood” blinds too? Thanks Mel! 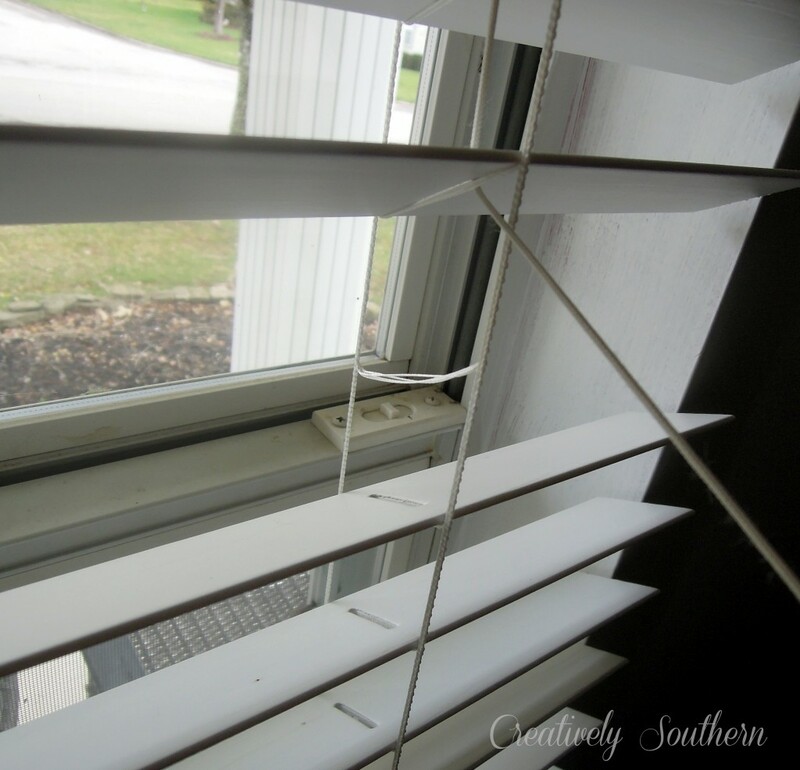 Actually, I’ve posted this over on Hometalk and there are alot of comments there about how to clean real wood blinds. Some people are suggesting using Murphy’s Oil Wood Soap and only leaving the blinds in for a few seconds, but if their real wood, I’m a little nervous to drop them in a tub of water! 🙂 Maybe try wiping them down with a damp cloth and Murphy’s Oil soap. I would definitely try wiping them down with a fabric softener sheet too, to help repel dust. Hope that helps ya! Thanks so much for your comments and visiting!! This is great! Just pinned it!!! Great idea Jeannette! I’m so ready for warmer weather. It makes Spring cleaning so much easier, doesn’t it? i wash my blinds in a dishwasher, and it’s perfect! tell me how, I have 4 sets in livingroom that are currently accessible as floor was redone, and all furniture it out till next week or so they say. Not to mention 5 upstairs. Ivana, I love it! Although do you think my hubby would have me committed if he saw me packing the blinds in the dishwasher without saying anything first? hahaha Thanks for sharing your tip and for visiting today! You are saving my life right now! I had no idea you could actually fix them! I usually toss them and buy new, and that gets a little expensive! Thank so much for sharing!!! Jessica, I seriously was tossing these out to the trash when I saw the slats on the bottom and the light bulb suddenly went off. haha! Glad this was helpful for you!